RUSH: Folks, there’s a lot of stuff in the stacks today. It’s not just Ebola. We have the usual Ebola stuff. By the way, that New York Times story, Jonathan Martin had it. “Ebola Response Another Example of Obama Not Running Competent Government.” Another example! The Washington Free Beacon has the analysis: “New York Times political correspondent Jonathan Martin,” who used to be at Politico, by the way, “said President Obama’s response to the Ebola crisis is yet another example that the president is not running a competent government. “‘This is a gift wrap issue for the GOP,’ Martin told CNN’s John King,” which means you didn’t hear it. I think we’ve got the sound bite of it coming up. He said, “This is one more example that they can cite to point out that President Obama has not run a competent federal government.” We’re now almost at the end of six years, and I think what this indicates — and it actually shouldn’t be a surprise. Everybody involved here knows that the last six years have been incompetent, or certainly the last four. Maybe the first two, the rose-colored glasses were on and everybody still had their high hopes and the honeymoon period and the utopian vision was in everybody’s sight. So maybe we give them a pass in the first two years, but they’ve known for much more than the last couple weeks, the past couple of months that things are not right here. The point of Tina Brown’s comment, all this business about women feeling unsafe aside, is what everybody feels is that nobody in charge knows what they’re doing. That’s what really is permeating the country. There is no confidence that the people in charge are qualified to deal with legitimate crises. There is no confidence in the leadership. That’s what has happened. Now, you and I have known this has been the case from day one. It’s only started to dawn on some people now because of the nature of their bias and their partisanship. But I think this is spreading all across the country now, and it’s across partisan lines. RUSH: Let me run down some of the things that we have today so that you have an idea of what’s coming. In regard what I was just talking about, the general sense — some Democrat the other day, I forget who, somebody said that Jimmy Carter is now looking better. Stop and think of that. I mean, Jimmy Carter, widely acknowledged as the worst president in the modern era. 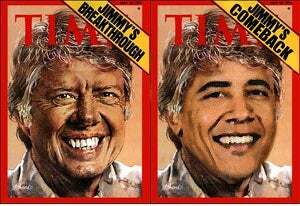 And now you’ve got people saying, on the Democrat side, that Obama is elevating even Jimmy Carter’s stature. The Politico has a poll, in regard to what I was just talking about, that there’s a general sense — you know, Tina Brown says Obama makes women feel unsafe. By the way, I didn’t know that Ebola was only a threat to women. But I know she was speaking specifically about women, because the polling data she was asked to analyze was about women and why Democrats are losing support from women in massive numbers. And the polls do say that, and her answer was, well, he just makes women feel unsafe, Ebola, ISIS, general incompetence, makes women feel unsafe, the economy. I think all across the country there is a high degree of unease. Look at all the crumbling institutions that people used to be able to count on that now they have doubts. The FDA, the IRS, the Veterans Administration, the presidency itself. Congress, of course, is always down in the dumps. Immigration. Nobody’s got any faith. I mean everything seems to have been corrupted, everything seems to be populated — CDC. This guy, Tom Frieden running the CDC. I mean, nobody’s inspiring confidence. There is nobody inspirational. There is nobody exhibiting inspirational, uplifting leadership. People need that. Anybody can be negative on their own. We got all the pessimism we need. Individuals can provide their own pessimism. The Democrat Party is rooted in it, though. The Democrat Party depends on pessimism and they exploit it and I think they even amplify it. The Democrat Party needs people to feel victimized. The Democrat Party, the left, need people to feel hopeless and thus turning to government for solutions. And that’s the problem! It is not a cliche, and it’s not, “Oh, easy for you to say” type thing to say that we need some inspirational, can-do leadership. Like I say, folks, we’ve got pessimism covered. Everybody can handle that on their own. Pessimism seems to be a natural trait that human beings all have. And it seems that escaping the bonds of pessimism requires a lot of effort. In other words, feeling positive and uplifted is not a natural state for everybody. I don’t think it’s a natural state for most people. Not gonna hazard guesses as to why. It’s just the way it is. People that come along and can teach you to think positively will make millions of dollars writing books on how to do it, for example. It’s the same thing I always say, we don’t need to be taught how to fail. Everybody knows how to do that, including Obama. But how to succeed is a whole different thing. If somebody came along, began speaking uplifting and positive about this country, about the great things that have happened, the great things we can do, the great things individuals can do, how important you are to making this country work, we could see a turnaround relatively quickly. But the Democrat Party is incapable of it. They don’t want that kind of attitude among voters. Not the mass, not the downtrodden, not the middle and lower classes. They don’t want people thinking up lifting, positive. The Democrat Party wants to be that in their lives. They don’t want people thinking they can do things on their own, and I’m not exaggerating here. I’m not trying to make anybody mad. But, on the other hand, on the Republican side, who is it that’s out there talking positively? I mean, we are enmeshed in a lot of negativism right now, and we are enmeshed in a lot of crises. We find ourselves surrounded by things that, if they go wrong, they could be very bad. Things are going wrong and it looks very bad. There’s a lot of people that don’t trust what they’re being told about anything. And that’s just not where this country’s always been. This country didn’t get where it is by being shrouded in fear and pessimism. Look at the surveys we see of Millennials who think it’s no longer possible that they will have better economic lives than their parents did. Well, that’s bogus, because there are people out there right now disproving that. It’s happening. The problem is many of those people become suspects. Many of those people end up being targeted by the very Democrat Party that claims that’s what they want for people. Successful people, all of a sudden, are suspects. Everybody thinks there must be something illegitimate about their success. You can’t really do that. And then you got the politically correct crowd that comes along and says it’s not fair that so many people are doing well and other people aren’t, it’s not fair, it’s humiliating. You know the drill. You know how this all goes. There needs to an entire shift in national attitude, and it’s going to take uplifting, positive leadership to make that happen. No question about it. And Obama’s not that. He sometimes tries to fake it, but he can’t pull it off ’cause he doesn’t believe it. Liberals, by virtue of their existence, are pessimists, negativists. Everything’s on the verge of going wrong. Everything’s on the verge of being destroyed. Everybody’s on the verge of losing their civil rights. Everybody’s on the verge of being a victim of something: racism, sexism, bigotry, homophobia, you name it. The Democrat Party I think is largely responsible for all of this national angst everybody is feeling. They’ve attacked every one of these institutions: marriage, religion, science, education, you name it. They have leveled an all-out assault on these things. Standards have deteriorated. Morality is no longer allowed to be defined or used. Nobody’s allowed to pass judgment on what’s obviously right or wrong. And so there’s no foundation. There aren’t any guardrails anymore. And yet it is my contention that the majority of the country is not of this particular way of thinking. They themselves are imprisoned or being victimized by it, because the media makes it look like they are in a minority. I still believe the vast majority of people in this country are decent, upstanding, positive, willing to play by the rules, trying to do everything as best they can, and as right as they can. But when they look out over the landscape, they see people like them being made fun of and mocked and laughed at, be it on television, be it in political ads. So it’s no wonder that people who are rooted in the great traditions and institutions of this country may think they are crumbling because they’re routinely assaulted, they, the people and the institutions. (interruption) She didn’t mention it. How many women do you think feel unsafe because of Obamacare? Tina Brown didn’t mention it.